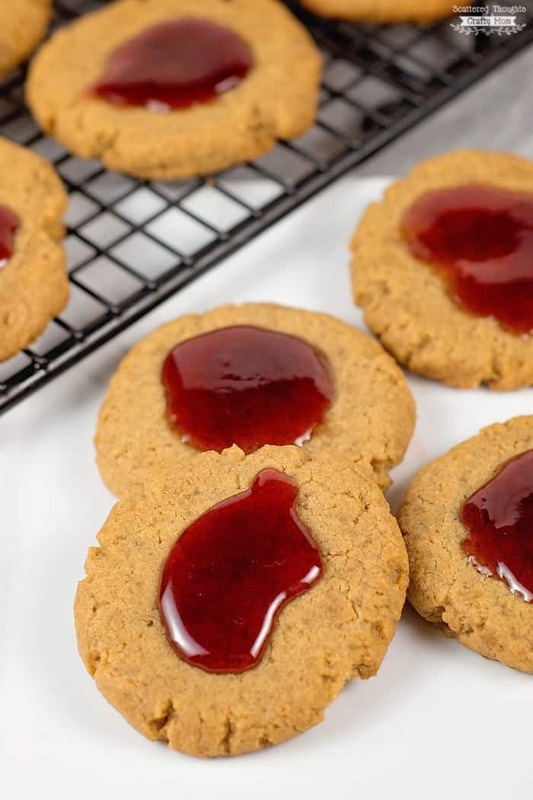 These Flourless Peanut Butter and Jelly Cookies are low in sugar and full of protein. Perfect for a quick grab and go breakfast or afterschool snack! Thank you to Smucker’s for sponsoring this post, all opinions are mine! 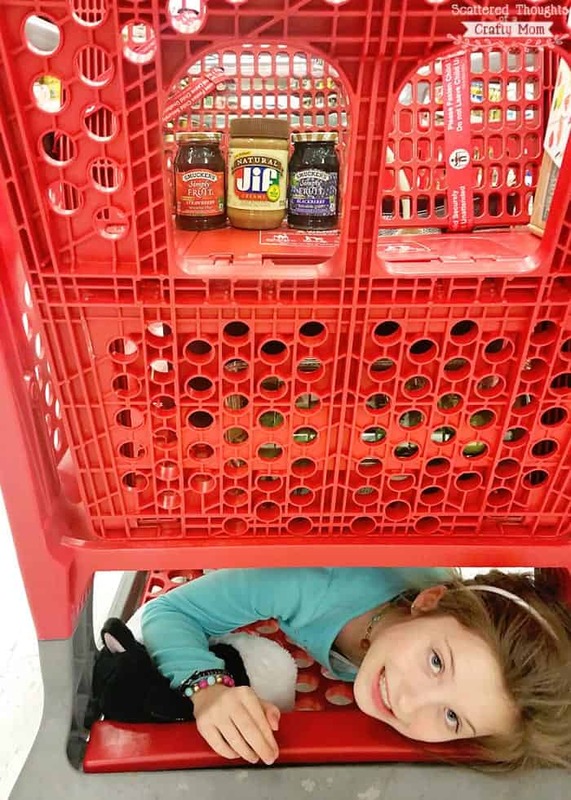 When it comes to morning routines at out house, I have two children who have the complete opposite morning personalities. One child wakes up with a smile; an I love you and in a happy, pleasant mood. The other child is as grouchy as a bear waking up from a seven-month hibernation. He hates getting up, he hates the cold, he hates oatmeal, he hates brushing his teeth, he hates the jacket I just bought him. He hates taking allergy medicine… and the list just goes on and on! 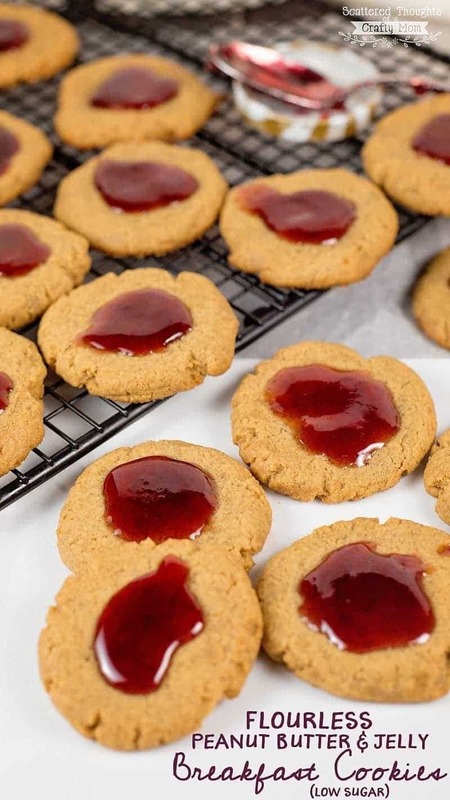 No Mom wants to send her child off to school with a belly full of sugar and no protein, and that’s why these Flourless Peanut Butter and Jelly Cookies are a win-win for breakfast at our house. They look like a cookie and taste like a cookie but are packed full of protein and are low in sugar. These breakfast cookies are an excellent way to start your day or refuel for a busy afternoon full of homework and after-school activities. 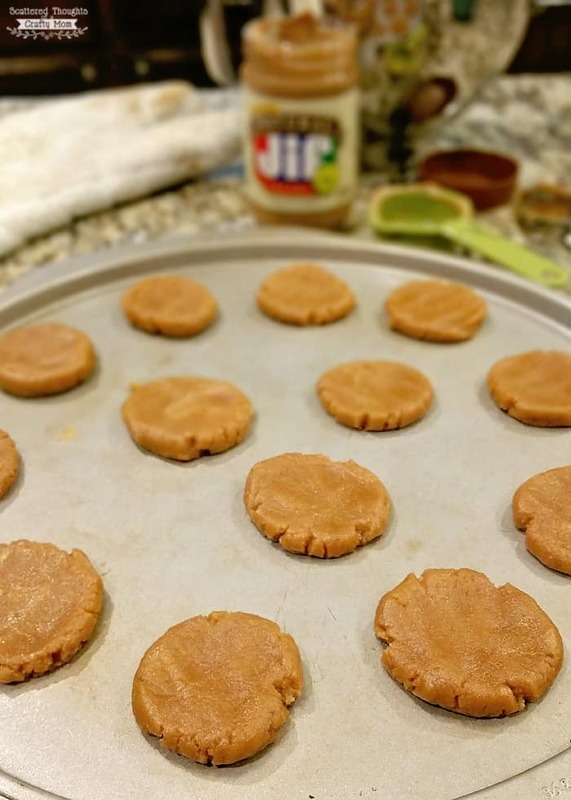 You read that right; these little peanut butter treats are made with only peanut butter, eggs, a touch of vanilla and a small amount of your favorite sweetener. No Flour! 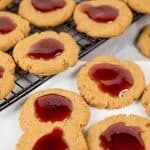 They’re topped with just a smidge of jam to give you that classic peanut butter and jelly flavor combination. 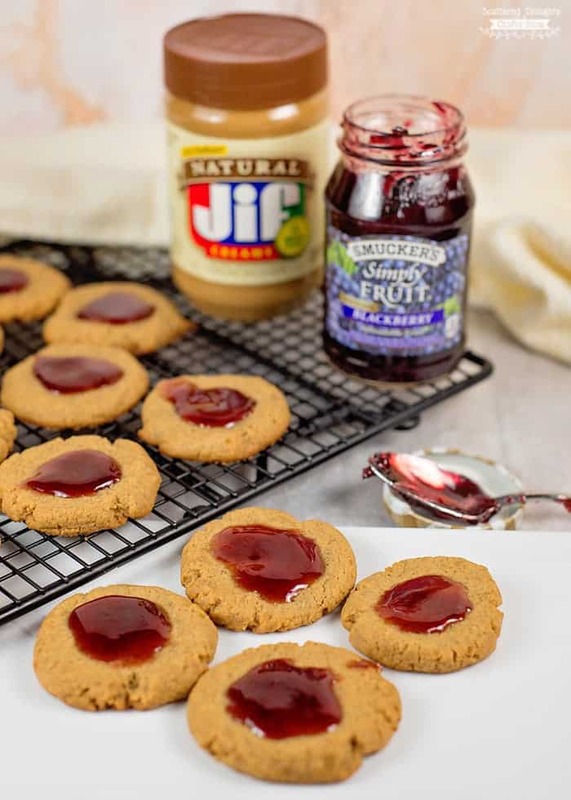 For the Peanut Butter, I used Jif Natural Creamy Peanut Butter and I used the Smucker’s Simply Fruit Blackberry Spreadable Fruit for the kid’s cookies (it’s seed-less) and made just a few for me with the Smucker’s Sugar-Free Strawberry Preserves. Smucker’s Fruit Spread of your choice. Mix peanut butter, sugar, salt, vanilla and egg until well combined. Using a spoon, add about 1 tablespoon of the cookie mixture about 1 inch apart onto ungreased baking sheet. Roll dough into rounds and flatten with fingers. Add 3 to 4 tablespoons of Jam to a small bowl. Microwave about 15 to 20 seconds or until jam is runny. 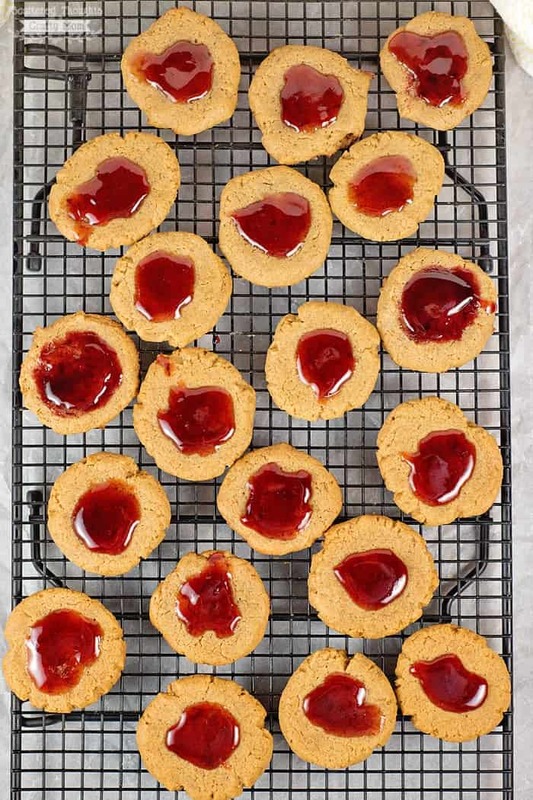 Working quickly with spoon, add a small amount of jam to tops of cookies. 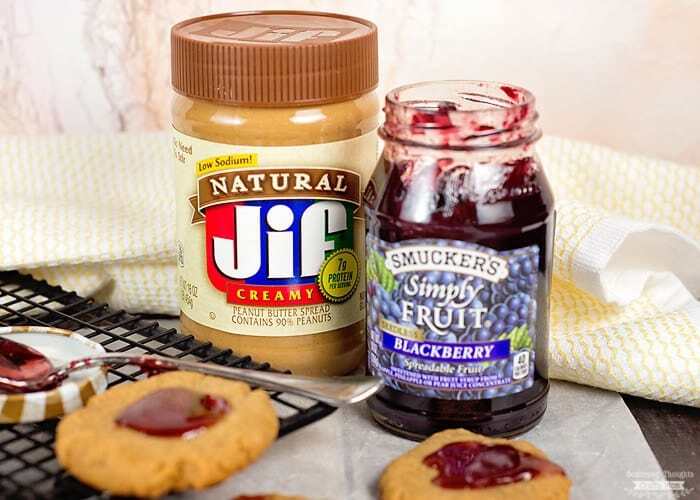 What’s your favorite recipe with peanut butter and jelly? 1- I am in absolute LOVE with your blog header! It is beautiful! 2- These are GENIUS!!! my kiddos are going to go crazy over them. THANKS !! Oh my goodness do these look enticing! The kids would gobble them for afternoon snacks! What?! I have never seen these, but they look and sound delicious! My kids (and me) will love them! These cookies sure look good! Tasty way to start the day and these are great afternoon snacks too! I’ve never made flourless peanut butter cookies…these sound so easy! I love the addition of the jelly. Yum! Hurrah! I love a good breakfast cookie and I adore your take with the PB and J flavour combo! My kids would love these cookies! We can’t do peanut butter. Would this work with almond butter? They look amazing! I am almost certain it would. Let us know if you try it. About how many cookies will this recipe make? 12 to 16ish give or take a cookie and depending how big you make them.